18-year-old Magnus Berg has been playing guitar since he was seven, with an onstage performance at Buddy Guy�s Legends at 17. He leads his own band in his native Norway, but met singer/songwriter Kirsten Thien at a Florida blues club in 2012, while he was appearing with Mike Zito. Berg began co-writing with Thien, corresponding across the Atlantic, and also began playing lead guitar with her band, touring across the USA and Europe. Berg eventually signed with Thien�s record label, Screen Door Records, who recently released his debut, Cut Me Loose. Backed by a smoking hot band (Bj�rn Tore �Daffy� Larsen � harmonica, H�vard Sunde � drums, and Roy Oscar Pettersen � bass), along with several guest musicians, Berg rips through a powerful ten-song set, seven originals and three covers, that should serve notice that he is a force to be reckoned with, even at a relatively young age. The covers include a nice downhome version of Jim Jackson�s �Kansas City Blues,� a smoldering version of the Freddie King instrumental, �San-Ho-Zay,� and a smashing recreation of Muddy Waters� �Hoochie Coochie Man,� with crunching lead work, sizzling slide, and some spot-on keyboard work from Kristian Koppang. Additional artists on Cut Me Loose include Erik Boyd (bass, accordion, acoustic guitar), Magnus Westgaard (upright bass), Ola �verby (drums). Cut Me Loose is as solid a debut as I�ve heard in a long time. 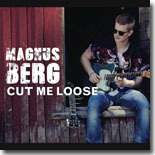 Magnus Berg looks to be a major player on the blues scene for a long time, based on this outstanding release. A fortuitous meeting with Kirsten Thien has resulted in Norwegian teen gunslinger Magnus Berg being signed to her label, Screendoor Records, and the result is an interesting tour de force, Cut Me Loose. Let�s give it a listen. Magnus is backed by a very tight band that includes: Bjorn Larsen on harmonica; Havard Sunde on drums and Roy Oscar Pettersen on the bass. It�s been a while since I�ve heard a band this young be this tight, but they are all that and more. They open with the title cut, �Cut Me Loose,� and all at once Roy�s bass is setting the tone for the tune. We find Magnus conflicted between his dreams and the girl he loves, it�s an interesting situation because he�d rather be free. �Every time I get home�I�d wanna pack my things and leave again�cramped up in the backseat�my six string is my only friend�out here�I need money and gas�won�t you cut me loose.� Bjorn blows a mean harp and I really love the energy of this Norwegian band. Up next is a tune Magnus wrote with Kirsten, �One Way to Please You,� and the tone is definitely lighter. �If there was one way to please you�.Lord knows I�d be your man�but you keep me guessing�well I knows I understand.� This girl is definitely tough to get but Magnus is giving it his best shot for sure. I continue to be impressed by Bjorn�s harp playing and the band just keeps bringing it. Tempo changes slightly with Magnus telling us he�s not happy with the way he�s being treated in �Drifting.� �Just like I�m swimming�against the stream�you don�t care, baby�you don�t know how I feel�. I�m drifting�away from your face�I wasted too much time on you baby�. I need to pack my bags and go.� This relationship is definitely over and Magnus is ready to head on down the road. The band slows things down a bit though the back end is still very strong as they segue into �When You Leave Me.� �I�m going to cry�I�m going to cry�when you leave me�here to die.� I�ve not mentioned Magnus�s guitar playing yet and he�s definitely a gunslinger. It�s easy to see why Kirsten also has him touring with her band as well. Up next is a tune by Jim Jackson, �Kansas City Blues,� and the band definitely treats us to an appreciated change from the powerful sounds of the first four tunes on the disc. �Mama taught me�and Papa taught me too�man, whiskey�s going to ruin you�I�m going to move to Kansas City�where they don�t know you.� Seems there�s are influences in Magnus�s life he needs to leave behind and Kansas City is the place to be. The Freddie King instrumental, �San-Ho-Zay,� is next and the band hits it head on. The band is in full swing and I�m grateful for the change of pace the tune provides. Our next cut, �When It�s Gone,� is another collaboration between Kirsten, Magnus and producer Erik Boyd. A touch of bluegrass is present as Kirsten tackles the vocals and let�s us know that �when it�s gone�it�s gone.� A bit of slide guitar from Magnus completes the picture and this tune is a gentle breath of fresh air in what so far has been a strong wind blowing. A powerful rendition of the Willie Dixon classic, �Hoochie Coochie Man,� is next before the band returns to another original song from Magnus, �St. Pete Boogie.� Magnus�s family likes to take winter trips to Florida to escape the cold weather of Norway, but the backbeat is decidedly Magnus�s creation. �I�m driving north�on 275�. I�m going to St. Pete.� It�s never really clear what�s in St. Petersburg, but the band is definitely traveling that way. A guitar riff from Magnus provides the intro for the final cut on the disc, �One Too Many.� Seems that Magnus� girlfriend is worrying that her man isn�t being faithful. �I had one too many�one too many�but I won�t do it again.� Despite his pleas for mercy, Magnus is out the door and his clothes aren�t far behind. Temptation cost him his girlfriend of the moment, but he doesn�t seem too broken up about his loss. Cut Me Loose is a really strong disc from this Norwegian teenager. It�s hard to believe he�s only 18 years old, but his songwriting is well developed, his band is tight and they�re love of the genre is inspiring. I took a quick look at Magnus�s website and it seems he�ll be in Memphis next week for the International Blues Challenge. I�m looking forward to seeing Magnus and the boys in action. IBC fans are in for a treat. His website is www.magnusbergmusic.com and check him out for yourself. We�re going to hear great things from Magnus for a long time to come.